Although Justin Ruggiano hit 18 home runs for the Miami Marlins, he also went hitless in 42 consecutive at-bats. 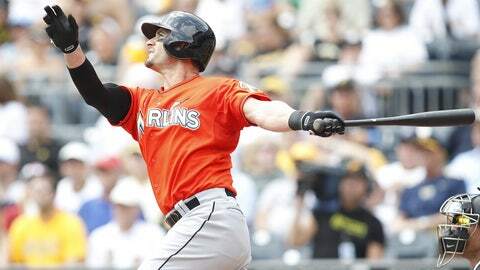 The Marlins traded outfielder Justin Ruggiano to the Chicago Cubs for outfielder Brian Bogusevic on Thursday. Ruggiano lost his starting role this season with the call-ups of Jake Marisnick and Christian Yelich. He batted .222 with the second-most home runs (18) and RBI (50) on the team over 128 games. Ruggiano also battled through an 0-for-42 hitless streak, just missing the MLB mark by four at-bats. Arbitration eligible for the first time, the 31-year-old hit .313 with 13 homers and 36 RBI in 2012 after arriving via a trade with the Astros that May. Bogusevic, who is not arbitration eligible until 2015, batted .273 with six homers and 16 RBI over 47 games with the Cubs. In 79 games with Triple-A Iowa he posted a .317 average, 14 doubles, three triples, 10 homers and 32 RBI. The 29-year-old spent parts of three seasons before that with the Astros, where he batted .227 with 11 home runs and 46 RBI. Bogusevic, like Ruggiano, can play all three outfield positions. “It was just within the framework of our plan,” said Michael Hill, president of baseball operations. “This has been ongoing, because we had been talking to the Cubs awhile on a number of different things. So this was just part (of it). There were conversations throughout just as we looked to reshape our roster. Miami has remained active this offseason, acquiring free agent catcher Jarrod Saltalamacchia, infielder Rafael Furcal and first baseman Garrett Jones. The Marlins traded Logan Morrison to the Mariners for right-handed reliever Carter Capps. In the Rule 5 Draft, the Marlins took AAA OF Brady Shoemaker (CWS), AAA 1B Justin Bour (CHC), AAA 3B Tony Thompson (OAK) and AA RHP Kelvin Castro (NYY). Andrew Astleford contributed to this story.